Last Monday David played guitar with Amadou & Mariam from Mali at the Crisis Hidden Gig held in the Union Chappel in Islington, London UK. The location for the show was revealed to the ticket holders the same day as a symbol of Crisisâ€™ work for the homeless in London. – David with his legendary Black Strat and the Hendrix strap. Picture kindly contributed by Richard Stone. David played on all nine songs performed by the band (aprox 1hr 25 mins) including a version of No Way from his solo album from 1978, which has never been performed live other than the promo clip from ’78. Read a full review of the Crisis show on Brian Damage. 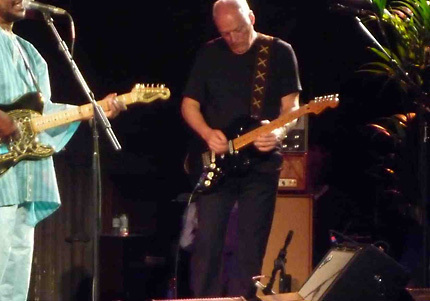 David was seen using the Black Strat â€“ confirmed by the Hendrix strap â€“ while both the red Strat with the EMGs and the Gretsch Duo Jet was also spotted in the back but not used. 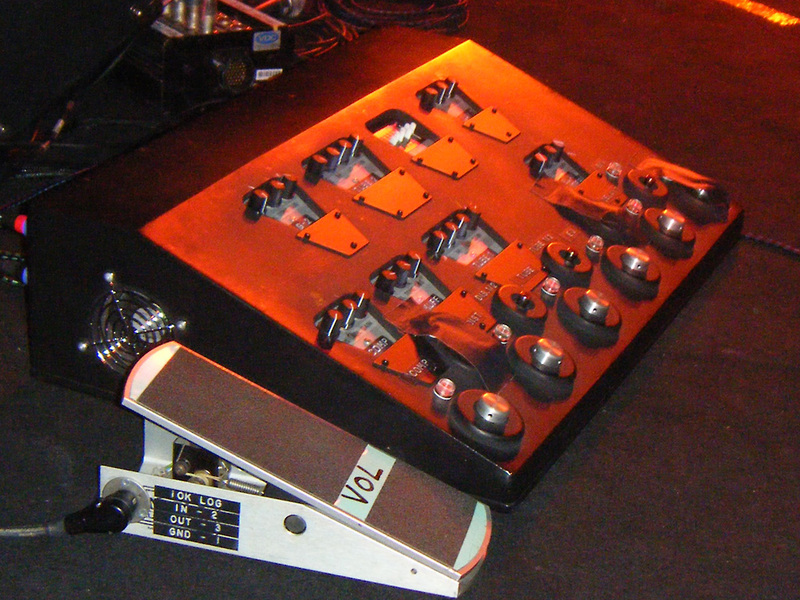 The limited space on the rather cramped stage only allowed a small setup consisting of an Alessandro Bluetick 20w tube head (as seen on several 2006/07 performances) with matching cabinet. It also looked like he used an Fender Twin for monitor (note: an odd choice since he normally uses Bassman combos so this might be Amadou’s amp but it looks very much like there’s an Evidence Audio cable going into the amp, which indicates that David used it). – David with an an Alessandro Bluetick 20w tube head with matching cabinet behind him. Picture kindly contributed by Darran. 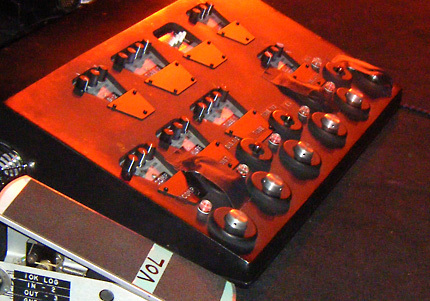 – Close up of the Pete Cornish 2006 pedal board. Notice the tape covering the on/off switches for the send/return effects. Click for larger image! Picture kindly contributed by Liam Schwartz. A handful of Gilmourish.Com friends very lucky to attend the show and has reported that it was a great night and a special treat to see David on a small stage so close to the audience. A big thanks to Darran, Richard and Liam for contributing pictures! yeh, I reckon that, too… especially the fabric, it’s amazing! but did you get the impression that david’s strap looks a little lighter in colour than on most photographs or on film? I should have put my question like that in the first way.. ;), b/c this is what I would assume then. jeri’s strap is lighter in colour (at least mine) than david’s on photographs and film (and even there it depends on the light and everything…). I took pictures of my strap, not even with a great camera, and alas the strap looked darker when photographed (with the laces a bit brighter), hence my assumption. I have two of martin pryce’s straps, they are a lot darker, with brighter laces. happy to say that I was there and what a fantastic night it was. I knew that it would be a small gig but bever expected to be so closem I could see the wear on the fret board! Could I ask a huge favour and ask you to send me any of the pictures that you have of the gig? I would be extraordinarly grateful. And if by any chance the beautiful French girl sitting next to me would like to get in contact again please drop me a post! Ah! And looking back, you did mention it in your writeup – I should have read more closely. But thanks Bjorn for shedding light on such a very cool retro piece of tech! Bjorn – as long as we’re asking “basic” questions – what the heck is that 4-button do-hicky with the little red-blue screen that looks like an oscilloscope? You can just see it behind David’s left elbow in the second picture above, sitting on top of the Bluetick. I saw it on the Island tour too. Holy crap! He got up close pics of the black strat and hes sending them to you, Bjorn? You have to post those as soon as you get them or just e-mail them to me. 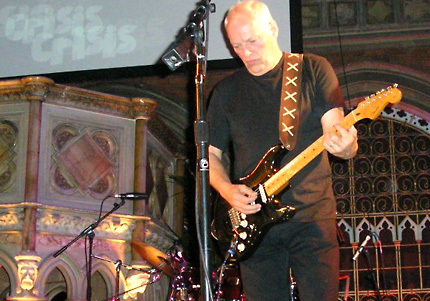 Im a total sucker for unofficial GIlmour pics! Keep it up! Thanks for sharing those outstanding pictures! Great stuff getting this up so quickly. I was surprised to hear that David did No Way on the 1984 tour, i know he did There’s No Way Out Of Here however this is the first i have heard of No Way being performed, would you know the date(s) it was done as i would like to hear it. Rad! Here’s hoping some audio hits the interwebs at some point. Was a fantastic night! Me and my friends all had a fantastic time! After a chat with Phil Taylor i can confirm that david was not using the the Fender amp for anything. Phil was also kind enough to let me have a very close up look at the black strat (Ill send you the pics Bjorn as soon as i get them on my computer ;) ) Even though he thaught i was a bit strange for wanting to do so! lol! I was also luck enough to meet Polly Samson, Phil Manzanera (a very very polite and interesting person!) and after the show David himself. Even managed to get my copy of On an Island signed by both David and Polly! O almost forgot, Phil Manzanera got a NOS Gilmour Strat for christmas! Haha! How cool is that? It’s great David has played No Way again!! To me, it’s one of the best songs from the ’78 album. Anyway, thanks for the info Bjorn…you are always on top! GREAT JOB !!! !… you are amazing like a Fbi or Cia agent !! This is a dimotration that Gimour Tone can be riproduced with simply gear setup…. Thanks again Bjorn. Always on the ball with the info and insight into David’s gigs. Nowadays I guess the first thing we photograph is his rig! I’ve never heard of those amps. I’ll have to do some research. Thanks again for keeping us up to date. Fender Twin might be for the other guitarist, Amadou. Hey, thanks for posting my photo! It was a great night, a once in a lifetime chance to see David’s playing up close and be able to hear his stage amps. Glad to see Liam’s sent a photo as well – it was good to have someone like-minded person next to me to share the experience with. By the way, Bjorn, I also splashed out on one of Jeri’s replica straps a few years ago and I’m very happy to report that now I’ve seen the real thing up close I couldn’t tell the difference!